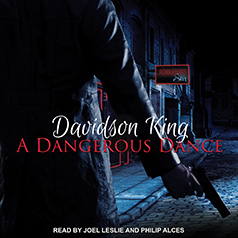 Davidson King presents Book 3 in the Haven Hart series. Contains mature themes. Finally working for a man he can trust has given Bill a new purpose. His boss, Christopher Manos, commands respect and absolute loyalty, and Bill has proven himself worthy of a seat at Christopher's table. Becoming best friends with Christopher's husband, Snow, has further proven his allegiance and cements a place for him in the Manos family. When Snow's life is in danger, Christopher places his full trust in Bill to destroy anything and anyone that poses a threat to his husband. But hunting and wiping out the enemy for the safety of everyone Bill cares about means partnering with the one person he has vowed to never see again. Mace wears a mask of vain cockiness and uses his model good looks to his full advantage. Known to many as Without a Trace Mace, he's a deadly assassin well known for wiping out whole families and getting away without a trace. With a dangerous past and an unknown future, Mace uses his veil of conceit to keep others at a distance, rarely trusting anyone. When his boss, Black—the one man he trusts above all others—gives him his next assignment, he learns his newest partner is none other than Bill, the man he'd do anything to avoid.